For U.S. history buffs, the allure of Philadelphia is evident. It’s the birthplace of the Declaration of Independence and the U.S. Constitution and home to the Liberty Bell and Independence Hall. For beer lovers, the city boasts a slew of unique breweries you can’t find anywhere else and for artsy-fartsy folks, this museum houses more Degas than the Llouvre in Paris. A lot of students who attend Bra Making with Madalynne workshops travel from out of town. 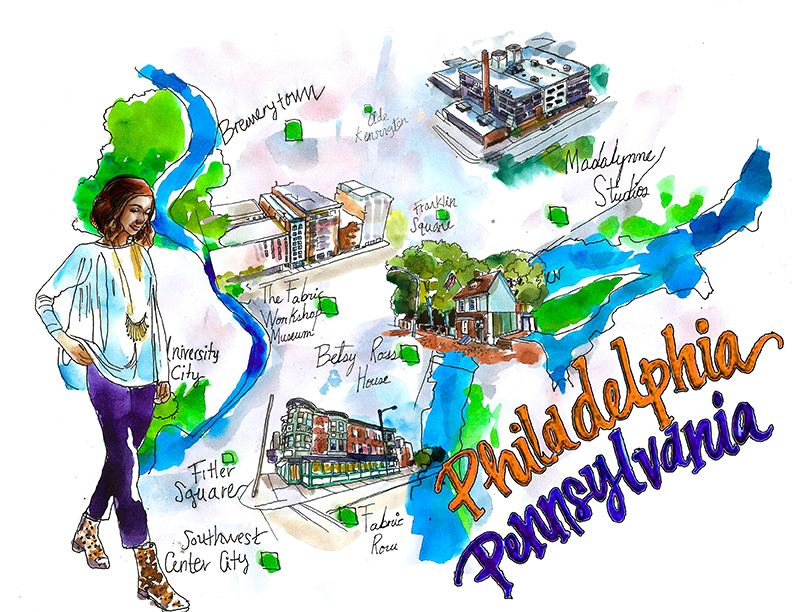 You may not think so, but the city of Brotherly Love has a lot to offer to us sewists. Ahem… Betsy Ross supposedly sewed the first American flag here. If you’re making a week or weekend of it, below are my top spots, broken down by neighborhood, for places to stay, eat, shop and have a blast. All are a short Uber away from Madalynne Studios, which is located in the northern section of Philadelphia. It’s in the old manufacturing section of the city – there are a lot of artist collective studios around – but not much else. At the end of this post are the fabric and notion stores. Before I get to the below, let’s talk about getting around Philadelphia. If you’re flying, you can take a 25 minute train to center city, but my preferred method for getting from the airport to the city as well as around town during your stay is Uber or Lyft. Parking can be difficult, especially in center city. There is free street and gated parking at Madalynne Studios by the way. If you are familiar with the subway, then you’ll take the Market/Frankford line to the Allegheny stop and then walk approximately 3 blocks. My top spot for hotels in this neighborhood. It’s right behind Parc, my favorite restaurant, as well as Rittenhouse Square. Just a few blocks away from The Warwick. It’s a contemporary, modern hotel that has boutique, hipster vibe. It has a cool bar in the lobby worth stopping and getting a drink. This one is on the edge of center city, but still within walking distance to everything. I suggest this hotel over Warwick and Palomar if you are interested in going to any of the museums – The Barnes, Philadelphia Museum of Art, Rodin. Lively mexican with delicious tacos, amazing cocktails and out of the box small plates. Try the scallop ceviche as an appetizer and then roasted cauliflower taco as a main meal. Don’t forget to order churros for dessert! Across the street from Mission. Harp & Crown combines a charming and rustic restaurant on the first floor and two lane, reservation only bowling in the basement. Try the heirloom beet salad for an appetizer and halibut as a main meal. French cuisine just like the french do. Very bougie. Whether it’s brunch, lunch or dinner, it’s always packed, so I suggest getting a reservation. If you’re in the city during spring, summer or fall, definitely grab a table al fresco and people watch out into Rittenhouse Square. Try the escargot for an appetizer, trout for a main meal, and creme brulee for dessert. Vegans, rejoice! Philadelphia has many options for vegetarians and vegans and this is my favorite in this neighborhood. It’s super dark and cosy and offers small plates to share. You can easily have 2-3 plates by yourself or 3-5 if you’re dining someone else. Hands down the largest selection of craft beer in center city. Also enjoy mussels and other Belgium-esque offerings in a brewpub setting. Liz Rymar is the owner of all Elle Lauri shops in the Philadelphia area and her cousin, Amanda, runs this location. Both are so sweet and helpful. Here you will find everyday and dressy blouses, tees and tops, skirts, dresses, jeans, jewelry, and other home goods. It’s no surprise that Wm. Mulherin’s was given a shout out by the New York Times. It is a v. cool and unique place to stay. With that comes a price however. Expect to pay more than any hotel in the city. If W.H. Mulheirns is out of your budget, look for AirBnB’s. There aren’t any other hotels that I’m aware of in this neighborhood. Feel free to send me an email with listings if you need help choosing. Good selection of new and used vinyls as well as cassette tapes and CDs. Bianca is the owner and has been a huge supporter of Madalynne. Her shop offers edgy clothing and jewelry by local designers. If my boyfriend and I have nothing to do, we’ll hit up Jinx. Even if we don’t buy anything, it’s worth a look through their vintage furniture and knick knacks. Sarah is the owner and she’ll probably start a conversation with you. Her shop sells both mens and womens vintage clothing and it was here that sparked creation of this dress. The original was out of my budget, so Sarah let me take it home and rub off the pattern so that I could make my own. A few stores down from Two Percent to Glory, Vestige offers upscale bohemian women’s clothing, jewelry and home good. The prices are up there but worth it – all of the items are truly unique and some are one of a kind. This restaurant was the hottest openings spring 2018 and I continue to see it pop up in major magazines such as Esquire. Lebanese style food. Another vegan friendly spot. Try the buffalo cauliflower – you must! Italian food set in an Irish bar. If you’re on a diet, do go here. Generous portions of the yummiest Italian food that’s as good as or even better than any South Philly restaurant. Barbeque – short ribs, cole slaw, macaroni, and more. Really casual environment with communal and picnic tables. Zoe is a fellow boss lady and has donated several cakes to Madalynne workshops. Out of her cute bakery, which she runs with her husband, you can pick up an expertly decorated cupcake, whoopie pie or cookie to satisfy your sweet tooth. They made Beyonce’s wedding cake. What more do I need to say? If you went to Fette Sau, hit up Frankford Hall, which is right next door. It’s a beer garden with ping pong tables, and fire pits during the fall and winter months. Just as unique as Wm. Mulherin’s in Fishtown but not as expensive. These bartenders take their drinks seriously. My favorite is the Gin Fizz and it takes about 10 minutes to make it to my table. They wait for the egg whites to form the perfect foam before adding the final pour of tonic water. Right next door to each out. Creative meals but on the pricier side. A food market with every and any type of food you can imagine. Old school ice cream parlour with the most decadent ice cream and sundaes. Be sure to hit up their chocolate shop next door too – Shane’s Confectionery. During the holiday and winter, this is the spot to go ice skating. During the summer, you can find carnival types rides such as a Ferris Wheel. Some say she sewed the first American flag while others say she didn’t. Whatever the case, it’s worth stopping by the Betsy Ross house while you’re here. Not your average sushi place. It’s a bar setting with loud music and manga cartoons playing on the wall. They don’t take reservations and are always packed, even on a Tuesday. For the best chance at getting a table, my boyfriend an I usually go just after 8PM, or right before the dinner rush. Right in the heart of Fabric Row, so if you go fabric shopping, make a quick stop for coffee or you can sit down for breakfast, lunch or dinner. If you’re a food lover and Reading Terminal Market is a must-see for you, then stay here. It’s a block away. Used to be an old train stop that is now a food hall. It has everything from fresh fish, to donuts, cheese, beer, sandwiches, and so much more. Popular BYOB Chinese restaurant offering hand-drawn noodles & traditional dishes in a comfy setting. There is no sign or bell – you just have to wait for someone to come out and get you. Once they do, you’ll enter the first room, where you’ll be told the house rules, which include no cell phones. Mr. Lee, the owner, is a craft cocktail genius. Don’t ask to change anything. Don’t want olives in your martini? Mr. Lee sticks to his menu. Mino is one of the owners. Typically bar food and almost everyone there is a local. Ethiopian food in a bar setting that probably hasn’t changed since the 1970s. My boyfriend and I have gone a few times for Quizzo on Wednesday night. Neighborhood brewery that is our go-to happy hour on Fridays. Also has a unique menu of small plate foods. Fleishman’s is by far my favorite store on Fabric Row. If they don’t have it, they will get it for you. When I was sourcing supplies for my bra workshop, I called Trish to see if she had underwires. At the time, she didn’t, but was willing to get them for me. 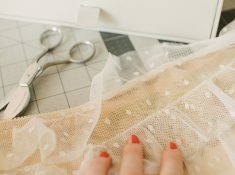 While they have a good selection of fabric and trimming – I bought the lace for my Malborough and the lining for Portia Blue here – their widest selection is sewing supplies. Interfacing, glue, zippers, elastic, hooks and eyes, seam rippers and more. Drexel University and Philadelphia University are two local colleges that have great fashion programs and most students come here for their supplies. This is also my go to for power net. Also, it is also open on Sunday. A family run business, Maxie’s Daughter used to be located in Philly’s Italian Market and was originally named Max Wilk Fabrics. Now run by Eric Trobman and his family, it was his grandfather, Max who immigrated from Russia and started the shop by renting a pushcart and folding scrap fabric neatly to get people to buy. When Wilk passed away in the early 1990s, his daughter, Beverly Trobman, took over. Three years later, she relocated to Fabric Row and renamed the store. The store is in the same location, which you can’t miss because of the giant mural on the side of the building. The right half of the store is dedicated to upholstery and drapery fabrics while the left side is dedicated to fashion fabric. Be prepared to hear family-style bickering between the staff. They are family after all! “Irving, can you help this young lady?”, “Irving, will you put this back?”, “Irving…. Irving… Irving…” It will only take a couple minutes to realize that one, Irving does a lot around, and two, the women clearly wear the pants in the relationship. The aisles are a tight squeeze, but you can bargain to get a fair price. Their selection is broad – silk, wool, cotton, spandex – but not very deep. They have the basics in every category. Another family-run operation, Jack B has been open for more than 35 years. Three generations later, they carry home décor and fashion fabric. 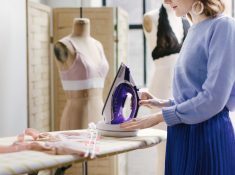 Their home décor selection is larger than their fashion fabric selection, but that doesn’t mean there isn’t something for garment sewers. For brides, there are lots of laces, and for lingerie makers, there are a host spandex, power net, and jersey. I bought the matte jersey for my thongs here. I have found that their prices are slightly higher than other stores on the street, but not enough to keep me from buying. They are also one of the few stores on Fabric Row that has an online shop and they are definitely the cleanest/most organized. Jomar is not located on Fabric Row, but it is the cheapest place to buy fabric in the city. It’s open until 9:00 PM Monday through Saturday and until 6:00 PM on Sunday. It’s also not located in the best neighborhood, so I don’t suggest going at night. This is not your average fabric store. A mix between a flea market and a warehouse, it sells discounted clothing, appliances, home goods on the first floor (think Marshalls or Ross) and fabric on the second floor. There is always a lot of fabric, but I never know what kind of selection they’re going to have. Sometimes I leave with nothing and sometimes I leave with 20+ yards. They have unique fabrics – I bought the fabric for Indigo Miller and my Japanese dress here. They sell trimming and few supplies, but no thread. If you’re a newbie sewer and don’t want to spend a lot of money or you want to make a project on the cheap, go to Jomar! Thank you! Philly has been on our list and it’s compounded my wish to take one of your classes in person! It doesn’t hurt to lure my bf with breweries as well! Thank you! You left off Gaffney! Probably not a great place for lingerie fabrics but their selection of cheap quilting cotton and knits is awesome! It’s in Germantown. Thought about including Gaffney! Since this is a Philly guide and it’s outside the city, it was left out.